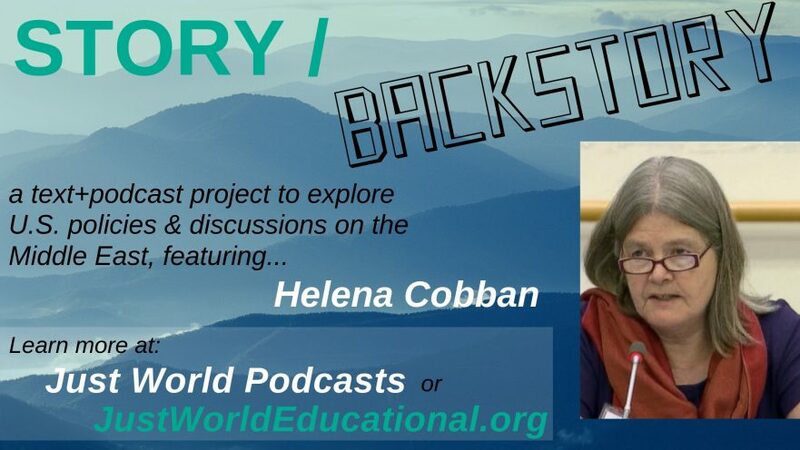 Just World Educational is pleased to announce the launch of a new multimedia project, featuring the work of JWE’s president Helena Cobban. The project is titled “Story/Backstory”. Each week, Helena will publish a punchy, op-ed-type column on some aspect of American policy on the Wednesday, and then follow that up on the Friday with 25- to 30-minute audio podcast in which first she reads the column and then she reflects more deeply on some of the issues in it. Look out, too, for more posts on the Just World Ed blog by Just World Book authors and allies, a strong JWE presence at the WRMEA’s annual pre/anti-AIPAC conference in DC in March, a campaign about the first anniversary of the Great March of Return, and more. We seek to educate and inspire the American public during these troubled times! I have been deeply impressed by what JWE has achieved during its short life span, and with its limited funds, has been so far able to achieve. We desperately need the voice of Helena Cobban and kindred spirits to spread light and bring truth. JWE examines American warmongering in the Middle East and elsewhere, and has plans that will contribute to more engaged, humane, and informed citizen participation in foreign policy with a special emphasis on the Palestinian quest for rights and Israel’s peace-denying expansionism. As for Helena herself, she said that after spending the past nine years supporting the voices of others she is extremely happy to be able once again to add her own voice to the growing public discussion of the Palestine Question and other key issues on the Middle East antiwar agenda. Helena has a rich and long history of writing about all aspects of Middle East politics, dating back to the time she spent as a Beirut-based correspondent reporter for The Christian Science Monitor and the London Sunday Times in the late 1970s and early 1980s. She moved to the United States in 1982, where she proceeded to write, over the years, a total of seven books on international issues, four of them covering Middle Eastern topics. Along the way she became very familiar with the vagaries of U.S. policy discussions on Middle Eastern topics. She contributed a column on global affairs to The Christian Science Monitor, 1990 through 2007, and a set of columns on U.S. issues to the London-based Arabic-language daily, 1992 through 2005. Helena, who recently moved back to Washington DC, is still a member of the Friends Meeting (Quakers) in Charlottesville, Virginia. She noted that the structure of the “Story/Backstory” project is still evolving and experimental, and that she invites feedback. One idea she said she might pursue would be to include more interview snippets in the material. She said she had enjoyed doing audio work ever since she worked as a backup reporter for both BBC radio and ABC radio in Beirut back in the 1970s, and hopes that the audio component of “Story/Backstory” can help this project to reach new audiences.